Despite their long, skinny looks, great blue herons have voracious appetites, and are very proficient predators that eat a wide variety of other wildlife. Small fish they stalk in the shallows are probably their most common prey. Still, they’ve been photographed eating foot-long catfish and carp up to three or four pounds. All were swallowed whole, with the visible lump in the bird’s throat seemingly as wide as its body. Great blues are about four-feet tall but have been seen catching, and swallowing snakes more than half that size, often with the snake still whipping its tail on the way down. Crawdads, bullfrogs and small turtles are common meals. They’ve been known to eat small ducks and young muskrats, too. 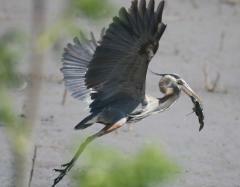 Great blue herons are common across Kansas, especially the eastern half of the state. They can be found around almost every impoundment, natural playa and stream. They often nest in tree-top colonies of 20 or more nests made of sticks. Such gatherings, called heronries, are often in the tallest sycamore trees along a stream. Probably thanks to warmer winters, more and more great blue herons are wintering in Kansas, hoping not all water turns to ice.